The artist known as Fish has made no secret of his desire to retire from the music business, announcing plans on the completion of his last studio album, Feast of Consequences, to make one more record, to tour and then move on to different projects. Those projects over time have changed along with the dates for the new album, to be titled ‘Weltschmerz’, being pushed back. This fluidity is not to do, however, with any lack of ambition or inspiration to create, with, in fact, the opposite being true; the album has grown and grown with enough music to become a double album and Fish’s commitments to touring the 30th anniversary of Clutching at Straws meaning that the new release will not be ready until May 2019. 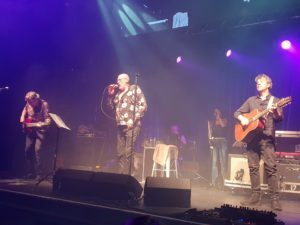 However, Fish, working with co-writers and band members Steve Vantsis and Robin Boult, have recorded three tracks for the album that have been released as an E.P. 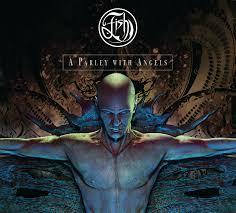 called A Parley With Angels as a taster of what the new album will become. These three tracks, Man With A Stick / Little Man What Now / Waverley Steps, have shown Fish fully embracing his progressive rock roots; the three tracks weigh in at a touch over 30 minutes, heavily reminiscent of the magnificent and mighty musical pieces Fish has always created throughout his career. And with Fish seemingly unconcerned with making music to fit to a ‘radio friendly’ format he’s given full reign to both his ability as a lyrical story teller and his co-writers talents creating magnificently soaring scores to produce a work that bodes well for the album that will follow. Not that radio should avoid this release, the short track (at just over 6 minutes in length) Man With A Stick, is a tune with catchy hooks, brilliant riffs and awesome flow that would grace any show happy to play clever and progressive music. It is no coincidence, I believe, that Fish is debuting these songs in a live arena along with the 30th anniversary tour of Clutching at Straws. Again i reference Man With A Stick as perhaps an answer 30 years later to Torch Song; one song suggesting that Fish would struggle to make 30, the new song perhaps saying ‘how did I make 60?’ What is certain, is that the narrative of the songs fits beautifully with the two works. And perhaps that will be the overwhelming feeling to the album when it is released, as Clutching was a fitting bookend to Fish era Marillion so Weltschmerz will also stand as a career defining project for the big man. A Parley With Angels is an awesome taster of what I’m sure is going to be one of my most eagerly awaited releases of 2019; it is for certain a near hour long celebration of an artist and writer at the top of his form, determined to leave the music business on a high and with an already top class reputation even more fully situated in the legendary class.